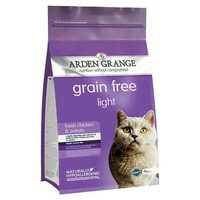 Arden Grange Grain Free Light Adult Cat Food (Chicken & Potato) is a nutritionally complete diet for overweight cats or those prone to gaining weight easily, such as neutered or indoor cats. A highly digestible diet made with generous helpings of fresh chicken, Arden Grange Light is lower in calories and fat, and contains a unique blend of nutrients and natural supplements to help promote optimum health, vitality and condition. Arden Grange Cat Food is free from grains and cereals to make it more closely resemble a cat’s natural diet. Our cats love Arden Grange and never tire of it. One cat has a sensitive stomach and this is one of the few dry foods she can tolerate. It is also great value as we find that the cats need to eat less of it compared to some other brands.